One of the things I enjoy most about my Milestone is the e-mail syncing; coming from a “dumb” phone, having it both takes all the fun out of booting up my e-mail client on my computer and made me more productive. However, when it comes to the Droid, we’re left with a split decision, so to speak: I use two different stock apps, “E-mail” and “Gmail” to manage my messages. It’s not like I’m forced to choose from one or the other – you can add Gmail accounts to the “E-mail” app (which I primarily use for IMAP accounts). However, when you initially add Gmail accounts to your Android phone, they’re handled by “Gmail” by default. This presents a little bit of a conundrum. Both apps do their job well and in some cases (having my “work” e-mails on “E-mail” and my personal ones on “Gmail”) it’s even beneficial. However, is it too much to ask to have one client for all your mail? Are there any apps that do it better than the default “E-mail” app? 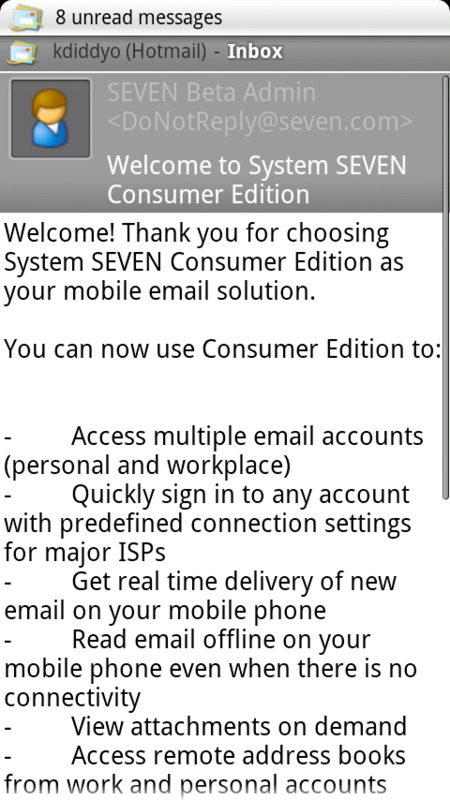 SEVEN (oh yes, that’s how it’s spelled, and who managed to get www.seven.com) is a family of apps that concentrate on mobile e-mail. They work with “dumb” phones and smart platforms alike, and are looking to expand into Android. 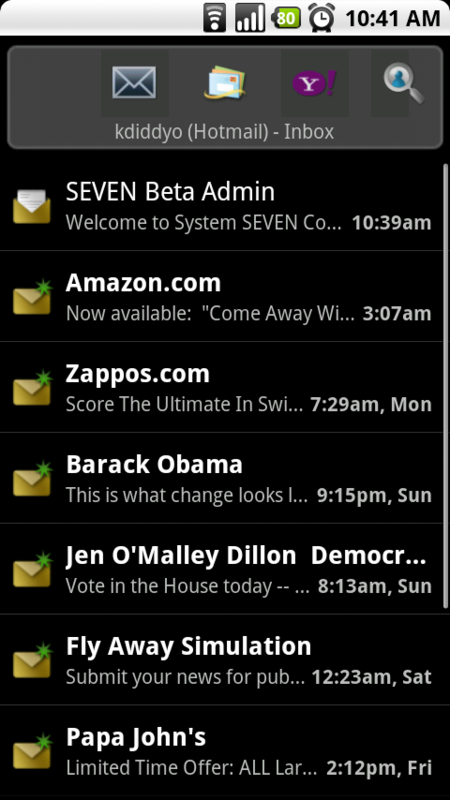 When it comes to key features, SEVEN does everything the default mail client does; you’ve got the notification bar functionality, the multiple accounts, signatures, address books and all the other things you’d normally expect. However, there are some advanced features that, frankly, impress me. Quiet time is a feature that sets it apart from Android’s default mail client. It’s the ability to set dates and times that your phone’s e-mail will essentially be shut off. Its uses include making sure your phone isn’t ringing during dinner, or on weekends. It’s configurable per account, too, so it’s great for forcing yourself to leave work at the office. This can also be manually triggered through a “Pause” and “Resume” function for each account. If the account is paused, it doesn’t sync with mail servers. This is similar to turning syncing off with a regular client, but it can be customized that it automatically resumes syncing after a certain amount of time. In order to save space, SEVEN can truncate posts, limiting the amount of data that’s transferred to your phone. Great if you have a limited amount of data, but really, if you’ve got a gig or more, I find you aren’t going to use it all up. Sliding your finger along the different folders quickly snaps the window to that inbox. Very handy for checking your mail at a glance. The combined inbox is replaced with a list of accounts, which display whether they’re in Quiet Mode, synced, or have mail. Great to see it all in one screen. This, however, is to be expected from a mail app. Just little things, like coloured notification tray icons, numbers on the icons to show how many new e-mails are present and the LED being blue (instead of green, which I usually reserve for texts) add a degree of polish to this app. What makes me enjoy this app so much is that despite the company making its service available on multiple platforms, its Android app still runs amazingly; I tend to get a bit pessimistic when that isn’t the situation. The fact that the developer took the time to build a proper app puts it ahead of companies who just slap something together in order to claim that they’re on every phone. However, for every positive, however, there seems to be negatives. While SEVEN is very full featured, I had a couple problems. While registered for this beta, you’re required to agree for the app to send texts to the Isle of Man (in the United Kingdom, kiddies), which seems a bit sketchy. I know that for some people, text messages outside the countries can be considered “roaming”, incurring fees. Apparently these texts are for verification purposes to make sure that the service works; I still don’t like that, though. Perhaps this can be better explained by a rep, or is only for the beta testing period, but for now, I’m going to label it sketchy. Contacts are synced into an address book per account, much like the default e-mail app. However, these are not integrated into your phone’s address book, and kept separate. I’m not a fan of having different places for different addresses; I thought the point of having a multi-account system on any device was to consolidate data? Nitpicking, but man, it’s annoying to have to go and change the “SENT BY SEVEN APP FROM MY ANDROID” signature for each individual account I register. It’d be best to just leave it blank, cheap advertising or no. The availability of custom signatures for each e-mail account is quite enticing, though. Ultimately, SEVEN’s shortcomings are not really that dealbreaking; I would use SEVEN’s client as a replacement for the Droid’s e-mail apps if I could get over one thing that bugs me: privacy. While SEVEN’s functionality is great, the handling of my data by someone other than the servers that host it (Gmail and Google Apps) or by programs transparent enough to trust (Thunderbird) just send up big red flags to me. I simply don’t know enough about SEVEN and its practices to trust my contacts, attachments and mail with them; why take the risk? I realize that this might seem highly ironic considering all the hullabaloo about Google’s privacy issues lately, but if there’s one thing the company’s done right, is earn my trust. In short, my peace of mind comes before functionality. SEVEN’s features, however, may be highly attractive to those who wish to separate their work lives from their home lives, and look to disconnect themselves from the constant stream of information smartphones provide access to. Users can make the judgement themselves when the Android app comes out of beta. Contrary to their press release, I could not find their app on the Marketplace, on or an indexing service like AndroLib.